For this adventure, we would hike the Press Expedition Route from the Elwha to Lake Quinault. This land is protected inside the Olympic National Park, so we were in for an adventure. We re-supplied food in Port Angeles, Washington and headed towards the trail. We started our adventure at the Whiskey Bend Trailhead in the Elwha Valley. From there we would hike on the Elwha River Trail 29 miles, to a pass called Low Divide. We reached the start of the Quinault at the Low Divide (Skyline Trail also starts here), and then we would walk the North Fork Quinault trail 16 miles down the river valley (North Fork Trailhead). Want to learn more? 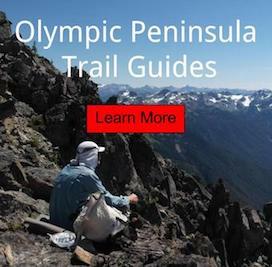 Complete trail guides to the Olympic Peninsula. Editor's Note: Article part of a multi-week backpacking trip in the Olympic National Park. The first few days were spent lounging around on gravel bars of the Elwha River. We were lazy and even doing laundry in the sun. We didn't see many people, but we did see numerous wildlife, which was a surprise to me; since it was so dry in the first. Just as the sun was going down I was already asleep. Something woke me and as my shelter fell halfway down. Recalled seeing a white flash as I awoke. The next morning the nature alarm of the sound of hoofs hitting the ground made me jump out of the Sleeping Bag. To my surprise it was a young Mountain Goat in the Elwha Valley. The Park is busy restoring Botten Cabin in the Elwha Valley. Woke up at 3am in the middle of a meteor shower, then again before sunrise, we tried to beat the bugs. On the next part of this adventure, we visit La Crosse Basin for a few days!